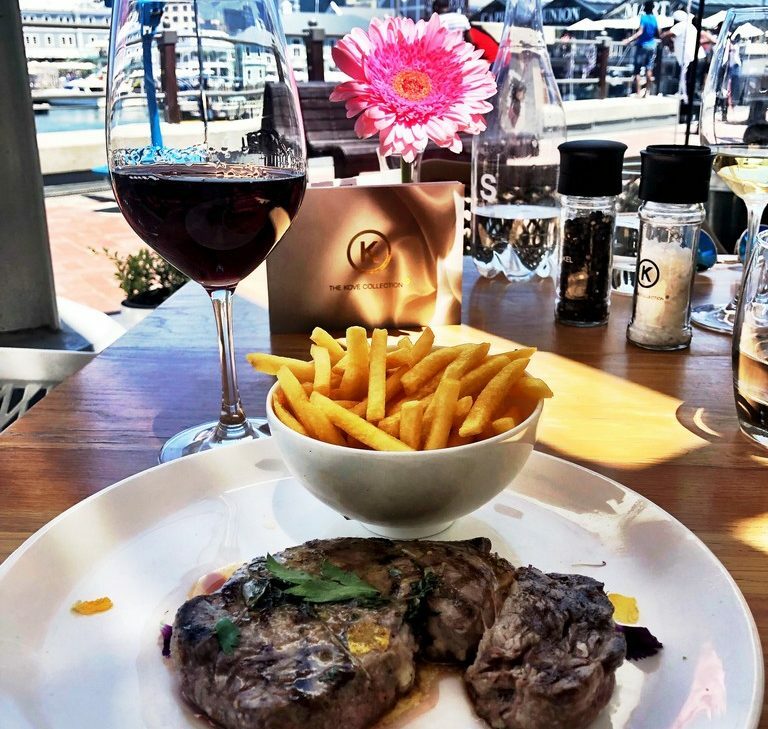 Part of the Kove Collection, Firefish is a welcome addition to the dining options at the V&A Waterfront. Here you will find something to suit every palate – from sushi and seafood to steaks and grills with everything in between. Full disclosure: as much as I enjoy the Waterfront, I tend to avoid it, especially during peak holiday season. However, this luncheon arrived smack bang in the middle of it all and once you’ve gotten over the traffic and parking, there are few finer places to while away a couple of pleasurable hours, and you can see why Cape Town is so popular with visitors to our fair city, with the view of the boats, the Cape Wheel, and Table Mountain. A little sushi moment was long overdue so we chose our starters from this section of the menu. From the signature dishes, I picked the butterfly sashimi (eight pieces) with prawn, prawn tempura, avocado and unagi (eel) but in hindsight, I must have got the wrong order because it wasn’t sashimi at all. My friend and I were talking so much I didn’t even notice other than there was now sushi in front of me and it was good. She had a trio of salmon roses and kindly allowed me one because no matter how much fancy sushi I eat, they are still my all-time favourite and I can happily live off an entire platter of roses and only roses. Other starters lean heavily to the ocean: oysters, fish cakes, mussels, delicious-sounding poached prawns with avocado, Bloody Mary aioli and cress, tuna tartare, whitebait, squid…with one meat (carpaccio) and two vegetarian option – fried goat’s cheese and grilled halloumi. You also have the choice of three salads, still one of my summer lunch go-to staples, with a nice chilled glass of wine. Unless there is sushi, of course. Vegetarian main courses include pan roasted asparagus with white bean hummus, walnut pesto and flat bread; herbed barley salad with butter-basted mushrooms, crispy shallots and parmesan; and grilled cauliflower steaks with cauliflower purée and walnut caper salsa. This last one is also ideal for those following a low carb or Banting lifestyle, and it’s interesting to see the humble cauli pitching up more and more as a main course (this is my third encounter in the space of a month, and it’s been ordered twice). Personally, I balk a little at the prices being charged, but it’s good to taste it in different guises to what you might make at home; a bit like chicken in that respect, which you can get here in the form of a breast with herbs, lemon and citrus rice, or buttermilk-fried in a brioche bun with spicy aioli, slaw and fries. For my main course, I had another favourite: aged ribeye with café de Paris butter and fries. Simple and delicious, especially with a nice glass of red, and there are plenty of by-the-glass options here. Red meat lovers are spoiled for choice – truffle fillet, grilled sirloin, aged rump, lamb cutlets…the list goes on. Add to this a bouquet of choices from the sea, and you’re bound to find something that takes your fancy. My friend had the lemon sole with herbs and fragrant citrus rice which she thoroughly enjoyed. We told our waiter we weren’t in the market for desserts, and quick as a flash he replied: “All right, I’ll bring back the wine list.” Clearly this clever gentleman had taken my measure. If we were going to have something sweet, we would have been faced with these delectable descriptions: coconut panna cotta with zesty citrus, lime soil and mango; baked cheesecake with pineapple sorbet, pineapple and coconut salsa; and iced nougat with salted almonds, sour cream and honey jelly, among others. * Open daily from noon till 10.30pm, Firefish is at Shop 154, Victoria Wharf, V&A Waterfront. Call 021 286 4933; or send an email to: firefishrestaurant.co.za.